We used to operate the food and souvenir concessions at Liberty State Park in Jersey City, NJ and sold Little Jimmy’s Italian Ice from our pushcarts located throughout the Park. Here is a video of a publicity stunt at Liberty State Park we just found on YouTube for the movie that’s out now called Chronicle. Our company ran the concessions by the ferry going to the Statue of Liberty from the 100th Birthday of Lady Liberty in 1986 till shortly after 9/11 in 2001. We sold various Statue of Liberty Souvenirs, and fast food items. 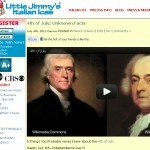 However, our number one item we sold to tourists going to the Statue of Liberty was Little Jimmy’s Italian Ice. We would outsell Haagen-Dazs 2 to 1 at the same price in our concession stand. People from all over the world would travel to see the Statue of Liberty in New York City and enjoy a Little Jimmy’s Italian Ice along the way. The box office is now officially open for the 2009 Christmas Spectacular at Radio City Music Hall in New York City. Little Jimmy’s Italian Ice was given out by Radio City Music Hall to all that attended the event that included Santa Claus, The Rockettes and New York Giant kicker Lawrence Tynes.